It's quite interesting to read up close century old facts and information, many of which are outdated. As you step away from the art print, the image starts to form a clear image. 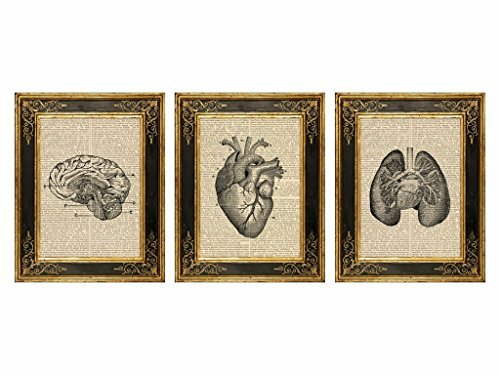 Our Art Prints on antique book pages look gorgeous on the wall, on the console and side tables, and they also make fantastic and unique gifts. Our art prints will fit nicely in an 8x10 frame or a mat with an opening for 8x10. You can get creative and use a smaller frame or mat opening as well for tight or partial display. We've provided real life example photos with 8x10 and 5x7 mat openings. If you have any questions about this product by Dreamery Studio, contact us by completing and submitting the form below. If you are looking for a specif part number, please include it with your message.